Save 23% off individual prices. 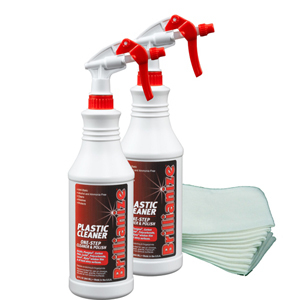 2 - 32 ounce spray bottles, induction sealed with cap. Grip trigger sprayers included. Trigger spray has adjustable nozzle for fine spray or stream. Unique anti-static, alcohol and ammonia free fluid. Safe to use around children and pets. No Doubt - The Best! From Tanthy of Kingwood, Texas on 2/8/2015 .